Termite Control Services - Should You or Shouldn’t You? Whether you live in an old or a new house, sooner or later termite control is going to become an issue. Naturally, this is the last thing on most people’s minds. Not only do these pests attack the wood in and around your home, leaving them untreated for too long can lead to extreme damage. For this reason, Chandler termite control services are highly recommended from a trusted company with a good reputation such as Varsity. After all, confronting the issue at hand as soon as you can is the best way to get rid of the damage that termites bring. 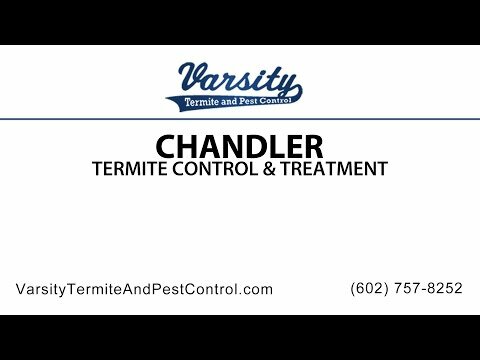 There are a ton of benefits when you hire out professional services like Varsity for termite control in Chandler. This is especially true when you compare it the control of pests such as termites, spiders or rodents. Companies like Varsity have technicians that have been trained and that comprehend how to handle and treat infestations of home pests including rodents and termites. Whether you have just moved into a home that has been vacant for some time or have built your own, you might want to consider periodic pest control services to put your mind at ease. After all, who wants to go home to a home full of pests? Remember that saying that you get a swarm running after you if you kill just one bee? The same holds true for house pests. Not only are you putting yourself at risk when you buy the wrong products, not effectively killing the pests you aim to get rid of can prolong the infestation of your home unnecessarily. Why risk it? Rather than guessing which products to use and what to do, go ahead and get a consultation from a great company that has a long standing good reputation like Varsity. This pest control service is top tier and saves you the hassle of trying to do everything yourself. The best part is that you won’t need to expose your entire family to hazardous chemicals. Instead, Varsity will take matters into their own hands and rid your home of pests conveniently. When your home is invaded by various pests including scorpions, it almost seems as if there is a battle between you and the pests. It may be futile to attempt to control pests on your own. Not only might this be expensive on your part, it might even be a health hazard, which is something you want to avoid. Get a more protected home from professional services like Varsity as the expert technicians not only take the size of your house into account, they also consider the kind of pests you actually have. For instance, there are emergency services to treat nests and hives as well as treatments for the home perimeter to keep termites and other bugs off your property. There are also options such as new construction pre treatments and long term preventive measures you can consider. No matter what pest issue you have, Varsity is the pest control service to call.